A one-day coyote hunting contest near Crandon in northeastern Wisconsin starts this morning. Aside from the concerns of many animal lovers that such massive shooting sprees of wild animals “for the fun of it” are ethically and morally inhumane, environmental groups have also concerned that federally protected wolves could unknowingly be killed in the process. The hunt will offer prize money for the largest, smallest and most coyotes killed. It’s one of a number of such competitions that hunters and the Department of Natural Resources say have been taking place for years. Saturday’s event, run out of a tavern in Argonne on the edge of the Chequamegon-Nicolet National Forest, caught the attention of representatives of the Friends of the Wisconsin Wolf, Sierra Club, Humane Society of the United States and the Center for Biological Diversity and other groups who criticized the contest element of the hunts. The groups also said they were worried that gray wolves could be shot or mauled by dogs that are often used in such hunts. “I am worried that this just increases the risk of someone violating the endangered species law,” Smith said. Saturday’s event has categories for hunters who use hounds and those who use calls to attract coyotes. It is illegal to kill wolves in Wisconsin, although there were wolf hunting seasons in 2012, 2013 and 2014 that were used as a means to control the state’s growing wolf population. A federal judge in December 2014 struck down a decision by the U.S. Fish and Wildlife Service to remove gray wolves from the endangered species list in Wisconsin, Minnesota and Michigan — a ruling that also ended legalized hunts. A coyote killing contest is also being held this weekend near Washburn in Bayfield County. The DNR says that it can be difficult at a distance to tell the difference between a wolf and a coyote. Wolves are larger and bulkier than coyotes. Wolves weigh 50 to 100 pounds. Coyotes weigh 25 to 45 pounds. Predator killing contests have come under criticism elsewhere, including several western states. In December 2014, the California Fish and Game Commission banned killing contests for predator animals, such as coyotes, fox and bobcat. California officials acted on a petition from Project Coyote, a Larkspur, Calif.-based organization that has worked with other groups to try to stop the practice in Arizona, Nevada, Idaho, Oregon and New Mexico. Camilla H. Fox, executive director of Project Coyote, predicted that other states will eventually follow California. 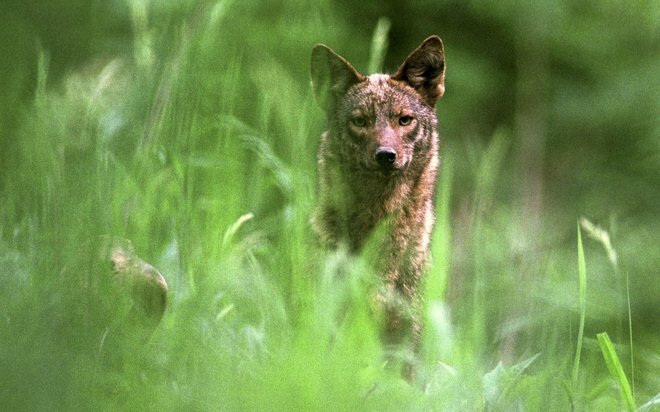 In its petition in California, Project Coyote used written testimony by more than two dozen academics and conservationists, including Adrian Treves, an associate professor of environmental studies and founder of the carnivore coexistence lab at the University of Wisconsin-Madison. Treves also serves on the science advisory board of Project Coyote. In their testimony, the scientists and conservationists said that “indiscriminate killing is ineffective” in controlling livestock losses because “only some, often few, individual predators participate in depredation.” They also said such contests are not a reliable method of regulating deer populations. “There is not a lot of scientific justification for it,” Treves said. Deer populations, for example, are much more influenced by food supply and climate conditions in the winter, he said. David Walz, a DNR conservation warden supervisor, said wardens will be working in the Crandon area on Saturday and will keep tabs on the contest. He said hunters have killed wolves during the gun-deer season, thinking that the wolves were coyotes. The state fine for unintentional killing of a wolf or other endangered species is up to $4,143, plus one-year revocation of all hunting licenses. If the killing is intentional, the fine is up to $5,500 and/or up to nine months jail, plus a three-year revocation of hunting licenses, according to the DNR. Source: Lee Bergquist f the Journal Sentinel, January 21, 2016.